Is Kindle 2 REALLY infringing author's copyright with the text-to-speech feature? 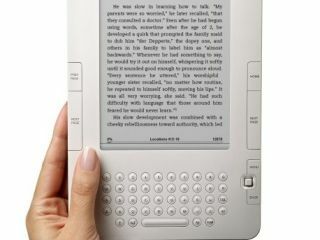 A coalition of charities for the blind and disabled is petitioning the American Authors' Guild to ensure Amazon keeps the text-to-speech feature on the Kindle 2 e-reader. The National Federation of the Blind in the US, along with the American Association of People with Disabilities, have formed the Reading Rights Coalition, staging an "informational protest" outside the office of the Authors' Guild in New York City. Should Amazon limit the Kindle's new text-to-speech feature then the group claims this unfairly restricts blind people's access to e-books. The move is a response to arguments from the Authors Guild claiming that the text-to-speech feature will negatively impact on sales of audio books, with Amazon planning to offer the option to publishers and authors to remove the feature from specific e-book titles. "Stop the greed, we want to read," was one slogan heard from the protesters in NYC this week. Amazon has already made over 260,000 books available for the Kindle, compared with only around 50,000 to 60,000 books generally available through libraries for the blind. In a statement, The Authors Guild called the protest "unfortunate and unnecessary," and claimed that they, "will not surrender our members' economic rights to Amazon or anyone else." The EFF notes that the Guild went so far to suggest that "Amazon could maintain a registry of verified blind and disabled people, who would be granted special permission to use the text-to-speech feature." The EFF adds: "The suggestion is of course ridiculous. Contrary to The Authors Guild's claims, the text-to-speech feature does not violate copyright law and does not pose any competitive threat to writers. "The feature should be enabled for all Kindle customers, not just those with disabilities. The Authors' Guild rightly laments 'how difficult the road ahead is for the already fragile economics of authorship' - but this is exactly why it was nonsensical of them to force Amazon to adopt a system that has made it more difficult for blind and disabled customers to legally purchase and read authors' works."